Cyprus Villa For Sale in Lofos, Tala, Paphos with large plot. This unique 6 bedroom detached villa is located on a large 1302 plot in Lofos, one of the most sought after residential neighbourhoods in Tala, within easy reach of Paphos and the International School. The traditional village is popular and has a great variety of amenities including local shops and a recently renovated village square with cafes, bars and restaurants. The accommodation is spacious throughout and the design such that the property can be utilised as one large family home, or as two individual properties. Each floor has it’s own entrance and self contained facilities. The ground floor accommodation features an open plan living room including lounge with fireplace and dining area, fully fitted modern kitchen, utility room, master bedroom with en-suite, two further double bedrooms, family size bathroom and guest cloakroom. Sliding patio doors from the living room and master bedroom provide easy access to the outdoor leisure area and gardens. The first floor is a similar layout and from here the gorgeous sea views can be enjoyed. The accommodation includes a living room with fireplace, wooden beam ceilings and balcony access, kitchen with utility area, master bedroom with en-suite, two double bedrooms and two family bathrooms. The gardens are well maintained and beautifully landscaped with a large variety of shrubs and trees. 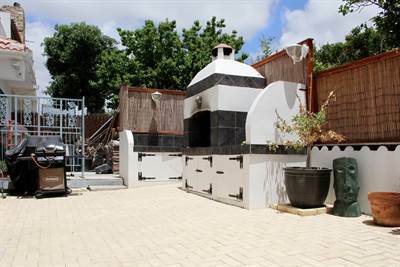 A custom built BBQ adds to the enjoyment of outdoor dining and entertaining. There is scope to convert a large workshop which already has electricity and water connected, into maids accommodation or an office/play room if required. Situated in a prime location of Tala, this wonderfully unique property with it’s diverse design and spacious accommodation is certainly something special.